The mortal remains of the Indian Army jawan from Vizag & Kupwara martyr Bhoota Venkata Ramana was flown down to Visakhapatnam yesterday night. Family and friends gathered to pay respects to the 38-year old jawan who lost his life during an alleged Pakistan-sponsored terrorist attack in Kashmir. 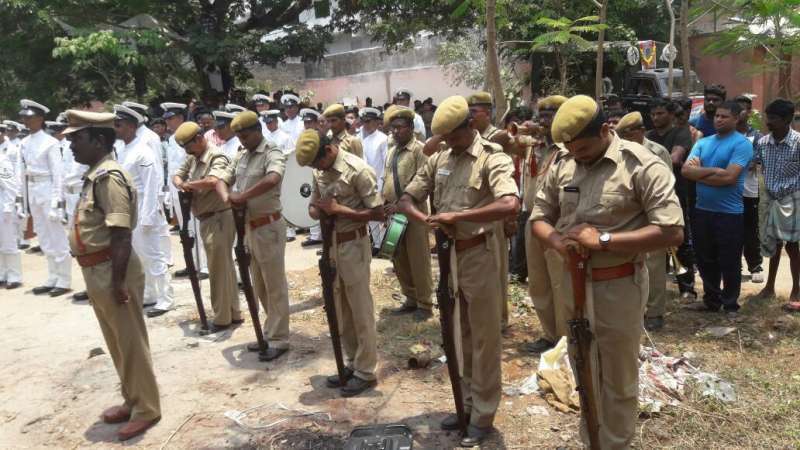 Floral tribute was paid on his arrival at the Naval air station INS Dega before the body was shifted to his residence. Naik Venkata Ramana served with the 16 Madras Regiment and his body was flown to Vizag from Jammu on a special Indian Air Force aircraft. The jawan was laid to rest today morning. 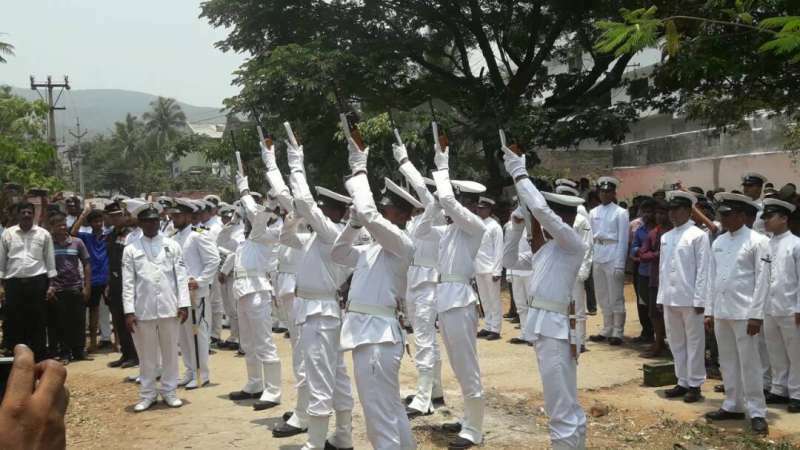 When his body arrived in the city, military honour and wreath laying ceremony were conducted at INS Dega by Colonel B Parkhe Admin Commandant, Station HQs (Army) Visakhapatnam and Captain SA Joglekar, Commanding Officer INS Dega as a mark of respect to the deceased. 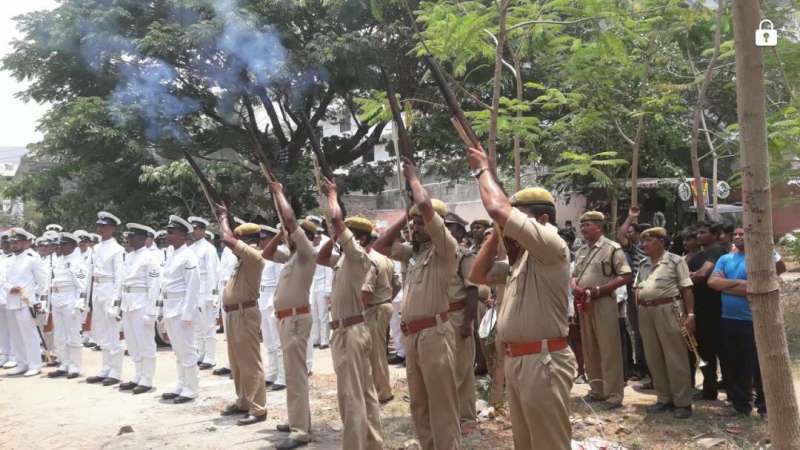 The Ceremonial Guard of Navy and police were in attendance. Also present to receive the body were P GVR Naidu Gana Babu – MLA of Visakhapatnam West, representatives of the District Administration Police and Capt P Satya Prasad (Retd) Zilla Sainik Welfare Officer. Before the body’s arrival, the Indian Army paid tribute to the ‘valour and sacrifice’ of the three fallen soldiers – Captain Ayush Yadav, Subedar B S Gujjar and Naik B V Ramana – at a ceremony held at the headquarters of 15 Corps. Floral tribute and wreath laying ceremonies were also held for the three, led by Corps Commander Lt Gen J S Sandhu, led by officers and other ranks of the army. Divisional Commissioner, Kashmir, Baseer Khan, Inspector General of Police S J M Gillani and senior paramilitary officers were in attendance. “The young officer Captain Ayush Yadav defied his 25 years of age and had established himself amongst his comrades as a spirited and daring soldier. The 46-years-old martyr Subedar Bhoop Singh had joined the Army in 1992 and is proudly remembered by his comrades as a highly professional soldier and a true patriot. 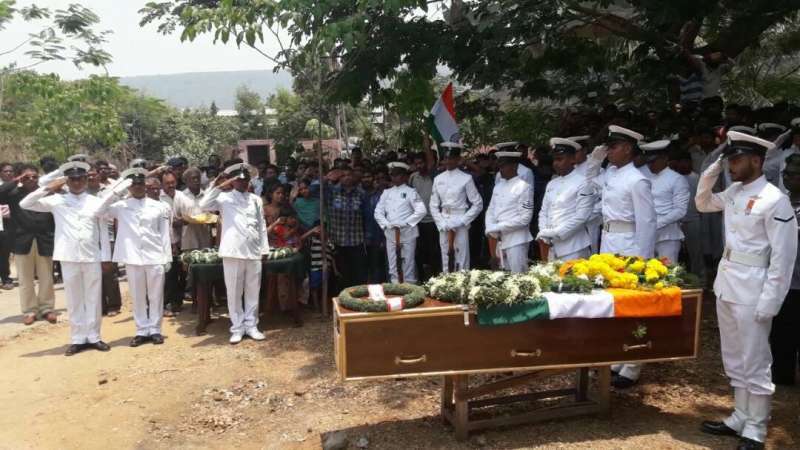 A true son of soil, Naik Botta Venkata Ramana, 38, had earned the respect of a warrior and was a friend to all,” a statement issued by the Army said. During the attack that took place in Kashmir, five other soldiers were injured and two militants were shot dead by one of the shaheed, while the third militant managed to escape. The Indian Army has launched a massive search operation to find him dead or alive. But soon after the attack, protests were held by the locals of Panzgam and Kralapora. The Indian Army had to open fire on protesters seeking the bodies of the slain militants, killing one and inuring ten protesters in the process.